exotic energy needed is still just a dream. sent an email to Seth Shostak SETI-NASA man as follows: Dear Seth, How would you explain to someone that possibly the future came back, and the evidence will be on archives of that morning, what type of evidence would record such a Huge UFO, where and on what instruments? On 11th September 2004 early morning between 6-8 my wife and I watched a UFO huge, typical shape, pastel coloured lights round middle, looked like it was spinning due to the small thunderous clouds that were racing through it? 8 minutes later we followed it up the road where it veered off east towards London. No need to report UFO as it passed along main Motorway ,hundreds must have seen it ,and besides it was 100 yards away from an Nuclear Research Station, hundreds of cameras, guards, radar, spectrometers, guider counters, gravitational meters, all sorts, many more, no need to report it? When I realised nobody had seen it only my wife and I it dawned on me we must have got caught up in its time tunnel-warp bubble, hence why no cars passing us, no birds, no sounds, tried to tell the authorities in my country (England) hoping they would investigate, but no cant even get a reply? Guess they think they would have been able to detect something of that size, being there for eight minutes or so? Haven't got a clue why us?, Don't know why it came here? but it did and it would have left a trail somewhere? SETI and its people would know best where to look? what instrument's would have distorted by the UFO? Sent letters and emails to everyone who might be able to call for an investigation, as this belongs to our future, the future of mankind, The day they come to me and my wife for tests on us, and question us for answers will be the day I know they found the UFO we saw. Hope you can bring this all to a head one day? Or at least ask why this so important sighting with all the archive evidence, that will prove all we saw, has never been investigated? Can answer any questions at any time via email. yours Michael lewendon END OF EMAIL Now you would not expect a man who has searched his whole life for E/T and proof of it to pass me on to MUFON who only data bases most UFO sightings, MUFON definitely have not got the power to investigate this sighting, and he knows that, he also knows that NASA has a big interest in the this Nuclear Establishment Has he been told to direct me towards a UFO data base site? that cant investigate an M.O.D Establishment? Cover up? don't know? what do you think? Or better yet, have them make me a sandwich. After all, we really need every single person to work only on the most urgent problem of the moment. ...And I could really use a grilled cheese right about now. Isn't this the technology that propelled the spaceships on Star Trek ? Yes. On Star Trek, they used a matter/anti-matter reaction to generate the proper amount of energy to create the warp bubble. We currently don't have the ability to make enough anti-matter to create a minuscule fraction of that energy but maybe we can come up with something else. Naquadriah, anyone? Also kind of same way Futurama's Planet Express ship travels, Nibbler provides the anti-matter. The image state explicitly that the speed is "subluminal": as the LIGO and VIRGO experiments have demonstrated with the detection of gravitation waves, deformation of space-time structure can only proceed at the speed of light. The ship is moving at subluminal speeds inside the bubble, the bubble itself is moving roughly 20 times the speed of light. Or at least that's the last prediction I'd heard about how fast it would travel. All we have to do is base it on carbon nanotubes. They can do anything. Sounds lie the expansion drive in "Bill the Galactic Hero" by Harry Harrison. Funny book. the laws in the space/time continuum are not much different than how a coil in an automobile is interrupted to jump the field energy from one winding to another, increasing a 12v source up in amps to make a powerful spark. Intermittently turning off & on a gravity generator wave frequency, in the field of atomic gravity, will make access to other dimensions of space/time, opening a door beyond the laws of this known universe to the laws of other universes . So it will not be breaking any laws, only entering a place with different laws.Or, at least accessing momentarily the laws of other dimensions . Hace 100 años nadie se atrevía a pensar que hoy habría aviones que transladan 600 pasajeros a 15000 Kilómetros a 900 kilómetros por hora !!! I have proposed a way of doing this which is somewhat different to this method, which I believe orients the Electric and Magnetic field in the same direction (correct me if I am wrong). The method I proposed is based on a theory I developed, as it appears that Positrons, in free space simply evaporate. This disappearance of charge, is mysterious, as a "hole" is produced, which still has Positive Charge, as information, but in the rare event that an Electron and a Hole Scatter, they produce one Gamma Ray photon, not two. So I proposed that the extra energy has gone into producing a Quanta of Space-Time. So when the Positron moves backward in time, it sends a Ghost forward with less energy and similar properties, and the extra energy expands Space-Time. Obviously one could construct a particle accelerator that Generate an Electron Positron Pair, and sends one each of them in opposite directions. The Electron out of the front of the vessel and the Positron out the rear. The timing has to be such that the Positron Evaporates into a hole, then the Electron would travel around the vessel and instead of scattering off a Positron, it simply occupies a previously non existing piece of Space-Time. So Expansion in back of the craft and contraction in the front should do the very same thing. The big difference with my theory, is that it could be tested, experimentally --- today! We need to see how long we can keep Electrons and Positrons away from each other, to see if in fact Positrons do evaporate into Holes. I have no idea why this is not an active project. Anyway, I am convinced my theory is now the best Field Theory ever devised as it clearly explains why there is very little antimatter, what Holes are, and why Electrons behave as a gas. Electrons behave as a gas because the empty space while not actually charged, has charge information in it, as it was previously charged, so "Entropy" allows the Electrons to expand in that empty space --- So "Entropy" is a field theory, part of Electromagnetism, at least in my theory "Kriske's Field Theory". Anyway, I wish I could get the funding to work on this idea. Just remember, it wasn't to long ago that man thought the speed of sound was just a pipe dream. Just how realistic is this project? And just what is the evidence that this "warp-drive" is even possible? My BBC link is about Olympus Mons. You should be able to find me on Google simply by searching for Keller BBC or BBC Keller. 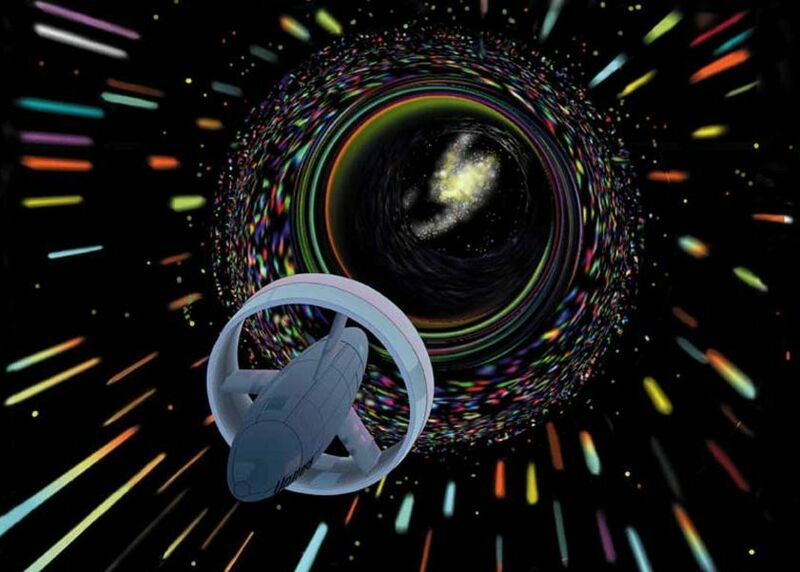 If this "warp-drive" is possible, won't it be possible to be practically teleported to anywhere in our solar system? How quickly would we be able to get to the Moon, for example?